Through many leadership opportunities, a challenging education and an internship in Washington, DC, Northwestern helped Sarah strengthen her Christian worldview and gain confidence in pursuing her dreams. 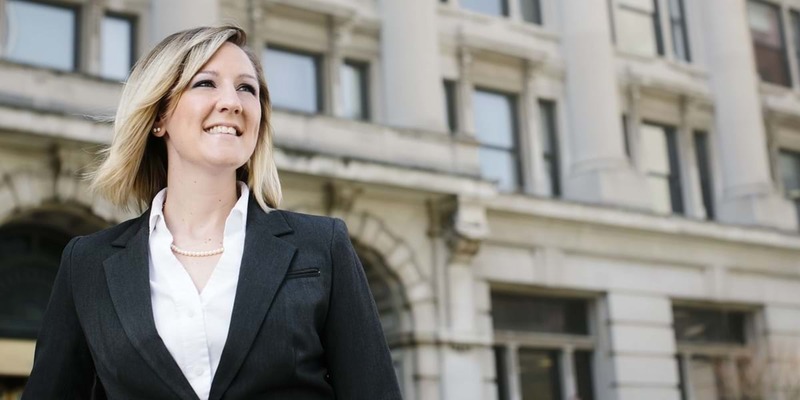 As a result, the political science major was accepted into Creighton Law School and now pursues justice as a deputy county attorney, juvenile division, in Omaha, seeking to help youth reach their potential. How well did Northwestern prepare you for law school and your career? Northwestern was academically rigorous and challenged my thinking, and those things are incredibly important to being successful in law school. Northwestern also helped me learn more about who I am, what my priorities are, and what kind of person I want to be in the workplace. What from your Northwestern education has most helped you in your job or law school? In politics and law there are always competing views. Northwestern taught me how to look at issues from all sides and effectively and respectfully communicate my arguments and opinions. My Northwestern education taught me that my identity is first and foremost a Christian—I am not an attorney who merely practices religion on the side. Northwestern also stressed servant leadership. Although I set my career aspirations high, it wasn't out of a desire to be powerful or make a lot of money. It was out of a desire to use the mind and work ethic God gave me to do justice and work with people who are less fortunate than I am. What did you most appreciate about your major? The political science department was small but provided big opportunities. Several classes were held around a conference room table, and that created a great environment for discussion with classmates and professors. I also participated in the American Studies Program semester in Washington, D.C. While there, I interned at the Legal Aid Society, which strengthened my interest in public service law. I was able to make friends from all over the country and take in the sights, sounds and experiences of the nation’s capital. How was your faith challenged and strengthened at Northwestern? Political science, more than other majors, is sometimes looked down on by Christians because politics has the reputation for being about greed, power and corruption. My professors did an excellent job of helping us draw connections between Christianity and politics and think about how Christians should interact with politics. In particular, my thinking about how Jesus would do politics was challenged by classes about pacifism and war. At times Christians are under fire in the political world, and we must know how to respond and defend our views. Northwestern gave me great tools to do this. Any favorite memories from your years at NWC? Many of my favorite memories stem from activities like A cappella Choir, Chamber Orchestra, Student Activities Council, Discipleship Groups, Student Leadership Council and Spring Service Project trips. I loved going on choir tours to California and New York. I loved the community at Northwestern and building relationships with people. I’ve always had a heart for kids, so the juvenile division is a great fit for me. The juvenile court system is rehabilitative rather than punitive, meaning we don’t punish kids with fines or jail time. Rather, we work to make the juvenile a productive member of society. I enjoy the opportunity to be a part of taking kids who aren’t in the best position and giving them hope. My job allows me to collaborate with other stakeholders—such as probation officers, therapists and the Department of Health and Human Resources—to get things done and maximize impact.